Conference organisers Dr Ciara Meehan (left) and Dr Jennifer Evans (right) with opening keynote speaker Professor Joanne Bailey (centre). One of my academic highlights of last year was attending a wonderful conference at the University of Hertfordshire exploring Perceptions of Pregnancy: Medieval to Modern. Just as impressive is that in the months since the community brought together really has bedded down, with a strong online presence in the form of a website that shares news, calls for papers and information about current projects in this field. Helpfully the New Year has seen some of this condensed into a new Members’ Directory, in which I’m happy to included. When I first saw the call for papers I thought this was something distinctly outside of my research to date, but the more I thought about it the less that seemed so. Over my years researching the role of payment in Britain’s pre-NHS hospital system it’s becoming increasingly clear to me that payment schemes were only in part a means of securing funding. In addition, perhaps more importantly, they were a ritual for performing certain aspects of citizenship: a willingness to make a contribution, sharing the burden as part of a community. It is impossible to separate this from the civic template of a good breadwinner. As such, it was an implicitly gendered and notably male construct. But where does this leave women in the history I’m writing? Their exclusion from the design of such an essential social mechanism is a story worth telling in itself. So is the ‘perception of pregnancy’ in my work simply one of exclusion? Only in part. More than this, it’s one of bucking the trend – a trend understood based on male experience. Maternity hospitals offer the opportunity to see both. With maternity cases excluded from the mutualist hospital contributory schemes, they were much more open to the old ways of medical philanthropy or the emergent wave of medical consumerism in the form of private beds for the middle classes. I first noticed maternity hospitals in particular as it jumped out from the figures I was gathering during my PhD – while these generally showed private beds to be more minimal than expected, maternity provision was clearly driving much of what there was. This left me with a question: were pregnant women the foremost factor in the growth of interwar private medicine in Britain’s previously free and philanthropic hospital system? With numerous small maternity hospitals in each major city and this prominence of paying middle-class patients, might we then see pregnant women not so much as excluded or marginalised but instead as empowered and liberated medical consumers? My scepticism over this apparent birth of the pregnant patient-consumer is something I plan to explore a little in the book I’m currently writing, and further for a chapter in the Perceptions of Pregnancy edited volume. In the book as at the conference, my own wonderings will be immensely enriched by sitting alongside some dynamic scholarship relating to pregnancy in the past. Joanne Bailey’s opening keynote certainly encapsulated this – guiding us through the emotional landscape of pregnancy in the long eighteenth century, where anxiety was the governing factor and uncertainty about the ‘little stranger’ characterised the relationship with the unborn. This was taken further in the closing keynote from Elaine Farrell, with harrowing tales of Irish infanticide that were both brought about and kept hidden out of desperation. 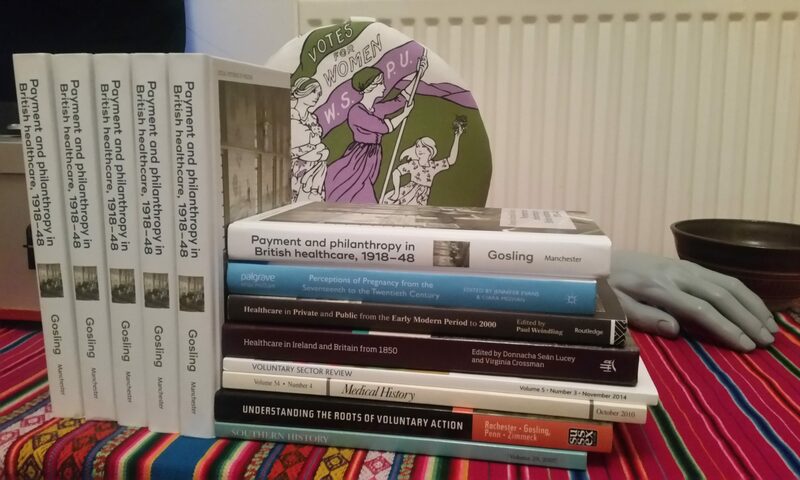 But across the conference I encountered dimensions of pregnancy’s history that would never have occurred to me – from the metaphor of (il)legitimate parenthood in the constitutional politics of the English Civil War to the twentieth-century social construction of a ‘natural’ birth. Beyond my own interest in the place of pregnant women within the emergent medical consumerism of the last century, this new network brings together so much that speaks to the personal and family experience of the past. I would encourage anyone interested to take a look. Conference organisers Dr Ciara Meehan (left) and Dr Jennifer Evans (right) with closing keynote speaker Dr Elaine Farrell (centre).